Palacio de los Deportes is a large outdoor arena in Mexico City. Palacio was built for the 1968 Summer Olympics, and has hosted many lucha libre events. Palacio de Los Deportes is located at Av. Rio Churubusco Y Anil, Col. Granjas, Delegacion Iztacalco. It was opened in on October 8, 1968, and seats around 20,000 fans. The building started hosting lucha libre in 1975, with the first event on January 29. The building was used primarily by the LLI promotion, it's first home before setting in El Toreo de Naucalpan. AAA used the building as it's TripleMania site in Mexico City until Arena Ciudad de Mexico opened. The most recent major event was the finals of the Lucha World Cup, 2016. 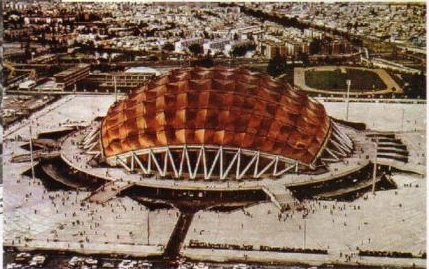 "Palacio de los Deportes" is a common term for buildings in Mexico. A much smaller and older building with the same name exists in Torreon. This page was last edited on 7 September 2018, at 13:18.